Harry Harby is remembered on the Bottesford Methodist Chapel Roll of Honour, and is one of the men named on the Bottesford ‘church list’ of WW1 Servicemen. Harry Harby was born in Pickworth Lincolnshire on the 10th February 1883. His parents were Henry Harby, who was born in Aslackby in 1853, and Mary Harby (nee France) who was born in Pickworth in August 1861. Harry was the eldest of their children, followed by Annie, Charles, William, Edward, Ellen, Arthur, Edith and George. In 1891 Harry was recorded as living at the home of his maternal grandmother Louisa France in Pickworth. In 1901 Harry Harby appears in the census working as a waggoner on a farm at Bottom Lodge, Croxton Kerrial in Leicestershire, and the 1911 census records that he worked as a plate layer on the GNR line. By then, Harry Harby had married Rose Taylor on the 1st June 1903. She was recorded in 1901 as a servant at a house called The Nook in Croxton Kerrial, so they had presumably met around that time. Rose Taylor had been born in 1879 in Bottesford, and after their marriage Harry and Rose lived on Butcher Row, High Street, Bottesford. Their daughter, Florence Edith Harby, was born there on14 of May 1904. 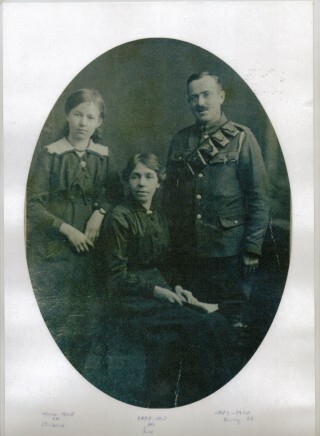 Florrie and her father wrote many postcards to each during WW1. 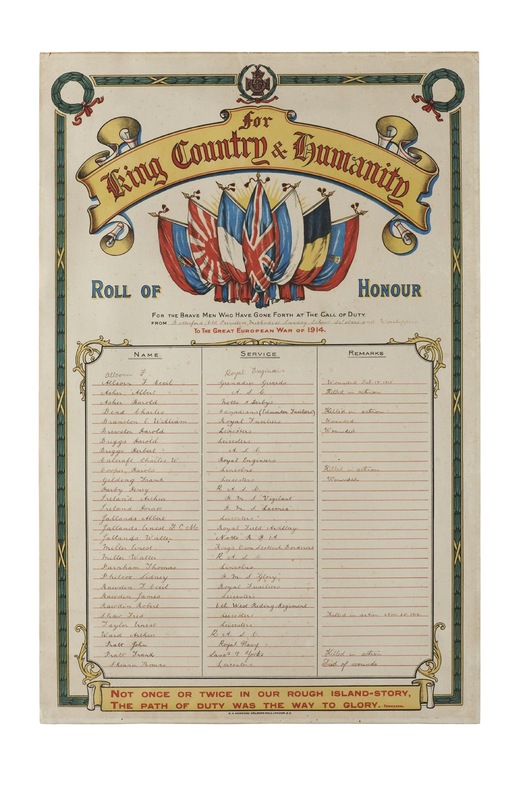 They have been made available to the Bottesford Parish WW1 centenary Project by Mrs Glenys Claricoats and are being published in the online archive on this website. Harry Harby signed up according to his Attestation Papers for a limited engagement on 23 February 1915 at Newark, with his height recorded as 5 foot 4 inches and his occupation as plate layer. He then entered active service at Bradford on 24 February 1915 and his Service Number was T4/061462. With experience of working with horses, he was posted to the Army Service Corps. The T4 in his Service Number indicates he was assigned to Horse Transport. He was part of the 4th intake of recruits for Kitchener’s New Army and was in training at camp in Willesden, north west London, in March. His unit was posted to join the 9th Army Corps of the Mediterranean Expeditionary Force, departing on 16 April and arrived in Egypt on 27th April 1915. From there they were soon shipped to Gallipoli. Driver H Harby ASC, who has been in the Dardenelles for some time, has written a cheery letter home in which he says that he and Driver Arthur Ward, another Bottesford man, had a fine time in Alexandria before going to the Gallipoli Peninsula. Drivers Harby and Ward have, however, been separated for 3 months. Harby says he is having a delightful time and is in the best of health. He would like to be remembered to all his friends at home. After the withdrawal from Gallipoli, Harry returned to Egypt for a while before being transfered to France around the 25 June 1916. He spent the rest of the war in France, serving with the 35th Field Ambulance until 19 March 1919. According to his pensioner medical records after the war he claimed for injury by shell shock In February 1918 though it is unclear of he was awarded any compensation. Harry Harby was demobbed and transferred to Class “Z” Army Reserve for demobilisation on 18 April 1919 at Woolwich Docks and returned home via Harrowby Barracks at Grantham. He was awarded the 14 /15 Star, the Victory Medal and the British Medal. Harry died on 23rd September 1950 aged 67 in Bottesford and his widow Rose died on 25th January 1967 aged 89 in Bottesford. They are buried in Bottesford churchyard close to Harry’s parents and with their daughter’s grave also nearby. 14 /15 Star, Victory Medal and British Medal.